In 2014, Krusinski Construction Co. built a fueling station for CN at Kirk Yard in Gary, Ind. Since 1995, the Class I has improved its fuel efficiency 36 percent while achieving record traffic growth. Photo – Krusinski Construction Co. There are several factors that impact freight railroads’ fuel consumption, including traffic mix, locomotive type, engineers’ operating habits and the weather. Most of them are controllable — and that’s a good thing because railroads consume a lot of fuel each year, as in tens of billions of gallons collectively. Although it’s cheaper than it was three to four years ago, diesel still eats up a big chunk of annual expenses. BNSF Railway Co., for example, spent $1.9 billion on fuel last year, when it consumed 1.3 billion gallons compared with 1.4 billion in 2015. Fuel costs ranked fourth among 2016 expenses, well behind compensation and benefits ($4.8 billion), but narrowly trailing both purchased services ($2.4 billion), and depreciation and amortization ($2.1 billion). Freight roads long have sought to better manage their fuel usage, not only to help cut operating expenses, but to be better environmental stewards by reducing air emissions. •refining engineers’ operating skills via coaching and training. The measures helped U.S. roads make additional efficiency strides last year. They consumed 617 million fewer gallons of diesel and emitted 6.9 million fewer tons of carbon dioxide in 2016 than they would have if their fuel efficiency had remained constant since 2000, according to a report issued in April by the Association of American Railroads (AAR). Over the past year, KCS formed a fuel conservation department that’s responsible for implementing diesel-saving initiatives. Railroads also are stretching each gallon of diesel a bit more each year. On average, each gallon consumed in 2016 moved one ton of freight 468 miles, up 99 percent since 1980 and 18 percent since 2000, according to the AAR report. Nonetheless, freight roads continue to seek ways to address consumption and boost efficiency. “Our challenge is to not become complacent. It’s important to take a systematic approach to fuel conservation,” said OmniTRAX Inc. Chief Operating Officer Sergio Sabatini in an email. Over the past four years, his company — which owns 21 short lines — has tried to do just that as it reduced its locomotive fleet from 145 to 75 units while handling a more than 15 percent bump in traffic. OmniTRAX has strived to follow a disciplined operating plan, adopt promising technologies, emphasize good operating practices and bolster training, said Sabatini. Although year-over-year consumption dropped by 951,000 gallons in 2015 and 400,000 gallons in 2016, the company can make additional strides, he believes. “We continue to look at new ways to reduce fuel [usage] as we grow as a company,” said Sabatini. Ditto for Union Pacific Railroad. Under the “something new” category, the Class I recently unveiled another version of its tapered Arrowedge® device, which was developed in 2014 to reduce drag on double-stack trains and help save fuel. Arrowedge 3.0 is designed to cut manufacturing costs by 88 percent, UP officials said in a 2016 Building America Report issued June 1. Fifty version-three devices will be built in 2017, they said. 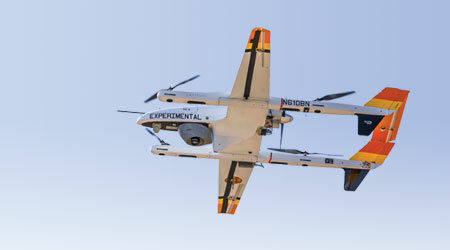 Students in Brigham Young University’s Capstone Program helped conduct wind tunnel tests on the Arrowedge and assisted in the redesign to make the device more cost-effective to produce, while maintaining or improving its aerodynamic capabilities. UP also continues to institute other fuel-saving measures, including locomotive acquisitions, technology adoptions and process improvements. Such efforts helped improve the Class I’s fuel efficiency rate 0.8 percent in 2016 compared with 0.6 percent in 2015, the report states. Plus, consumption dropped last year to 979.9 million gallons versus 1.07 billion gallons in 2015. Locomotive acquisitions continued in 2016, when UP bought 160 new fuel-efficient units that meet the U.S. Environmental Protection Agency’s Tier 4 emissions standard. The railroad — which had acquired 100 of the locomotives in 2015 — plans to purchase additional Tier 4 units in 2017. In terms of technology adoptions, 451 locomotives equipped with New York Air Brake’s Locomotive Engineer Assist/Display and Event Recorder (LEADER®) system completed 9.2 million trip miles in 2016, the UP report states. LEADER uses GPS maps to analyze train operations and prompt engineers when to accelerate and brake, helping to improve fuel economy. In addition, 987 UP locomotives equipped with GE Transportation’s Trip Optimizer™ completed 9.8 million trip miles last year. The system is designed to automatically control the throttle and help minimize fuel usage by calculating the most efficient way of operating a locomotive according to several factors, such as train length, weight, grade, track conditions and weather. Moreover, 408 UP locomotives now are equipped with Progress Rail/EMD’s SmartConsist™ fuel management system, which is designed to automatically select the optimal throttle notch combinations to optimize fuel economy. A cross-functional Fuel Mizers Load Testing Reduction Team is helping address efficiency, as well. The team implemented a more efficient process for locomotive tests that ensures engines and generators produce enough pulling horsepower. In 2016, the process reduced fuel consumption by more than 2.6 million gallons and improved locomotive reliability, the report states. Kansas City Southern has a group devoted to efficiency, too. Over the past year, the railroad formed a fuel conservation department that’s charged with identifying and implementing fuel savings initiatives throughout the company. Previously, there was no group responsible for conservation efforts, KCS officials said in an email. UP reduced fuel consumption to 979.9 million gallons in 2016 from 1.07 billion gallons in 2015. For example, the department is overseeing the implementation of Trip Optimizer as well as GE’s Smart HPT software to help reduce idling. 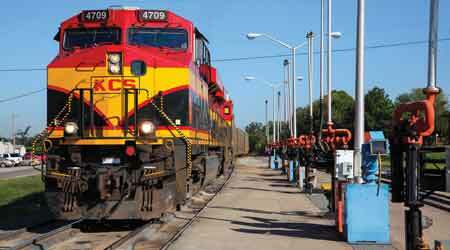 While the railroad for the past several years has equipped locomotives with Automatic Engine Start Stop (AESS) devices to help cut fuel usage, it recently began using Trip Optimizer, which has reduced total consumption about 1 percent annually, KCS officials said. Now, the railroad is preparing to implement Smart HPT — which is designed to control idling to maintain planned speed and save additional fuel — to further lower consumption in 2017. “Fuel burn forecasting by train type and fuel efficiency forecasting are identified for future initiatives [in the department], along with interoperability of Trip Optimizer and Smart HPT between railroads,” KCS officials said. To conserve more fuel, the Class I earlier this year launched an initiative that aims to enforce compliance with horsepower-per-ton (HPT) limits. Train crews are required to isolate units in their consist that are above the required HPT as identified in a timetable tonnage profile for their territory. For example, a 10,000-ton train in a modest-grade territory is assigned four locomotives, each rated at 4,400 horsepower. The engineer is required to use only three of them — applying 13,200 available horsepower — and would violate compliance guidelines if the fourth locomotive is used, KCS officials said. “There is an opportunity to reduce fuel usage by 6 million gallons annually,” they said. BNSF also emphasizes HPT optimization to eliminate excess horsepower. 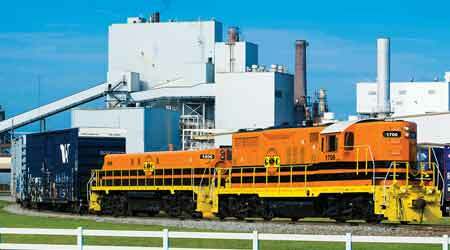 The Class I encourages crews to isolate a locomotive or limit the maximum throttle position used if a train has more horsepower than necessary for a given route segment, said Matt Feldman, BNSF’s general director for strategic fueling, in an email. Other efficiency boosters: the more than 1,500 top-of-rail friction modification units that are installed network-wide. The units apply a friction modifier to the top of a rail as a train passes, reducing rolling friction and lessening the amount of fuel required for a train to maintain track speed. Since 2005, BNSF also has purchased more than 3,000 new locomotives, which are up to 14 percent more fuel efficient than the units they replaced, said Feldman. Ninety-eight percent of the active fleet is equipped with AESS devices to conserve fuel while a locomotive isn’t active. In addition, more than 3,500 locomotives are equipped with energy management systems that allow the throttle and dynamic brake to be controlled automatically. The systems are designed to analyze a train’s makeup (weight/length/horsepower), the track geometry and speed restrictions to determine the most fuel-efficient way to operate a train across a territory while maintaining appropriate handling. Members of the short-line community are employing various technologies and measures as part of their fuel management programs, too. OmniTRAX in 2015 began installing auxiliary power units (APUs) on locomotives used by its 10 short lines that are most impacted by cold weather. APUs — which typically burn one gallon per hour versus five gallons by an idling locomotive — are designed to keep oil and water warm while the main engine is shut down, provide auxiliary power and reduce idling. In addition, OmniTRAX last year began implementing a GPS-enabled device supplied by Wi-Tronix LLC that connects all locomotive sensors — such as those that monitor speed and fuel level — via the internet and can help determine optimal fueling time. The use of the device will be expanded within the company, said OmniTRAX’s Sabatini. Since train-handling techniques also play a role in fuel usage, managers randomly download and review an engineer’s performance report, then discuss the positives and negatives one-on-one with the engineer, he said. 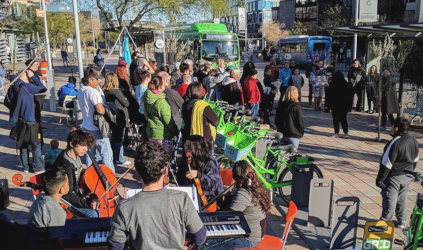 “We utilize this process to not just find fault, but find opportunities for praise … for those who are taking a good approach to conserving fuel,” said Sabatini. 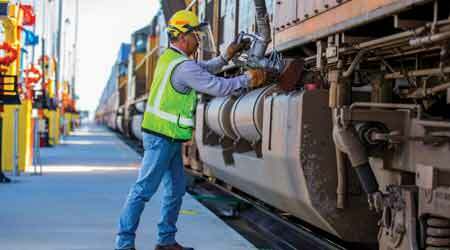 By far, the most significant fuel management benefits for Genesee & Wyoming Inc. (G&W) are generated by effective train-handling techniques and employees who properly follow locomotive shutdown procedures and policies, company officials said in an email. So, training is vital for G&W, which owns and operates 115 regionals and short lines in North America. The company relies on state-of-the-art locomotive simulators at its training center in Jacksonville, Fla., to “clearly demonstrate” good train-handling techniques to student engineers as well as the importance of following fuel conservation policies, G&W officials said. The simulators can calculate and display consumption based on the type and number of locomotives used, the grade encountered and the tonnage hauled on a particular run. The center is used to train about 100 student engineers annually. Although most trainees are seeking their initial engineer certification, certified engineers needing refresher training or those coming to the company from other railroads also use the center, G&W officials said. Experienced engineers also receive training on conservation policies at the regional/railroad level. In addition to training, G&W gains a fuel-efficiency boost by employing 18 “mother-slug” locomotive sets in its Canada, Coastal, Northeast, Pacific and Southern regions. The mother unit — a conventional diesel locomotive — is coupled with an engine-less slug unit that contains ballast to add sufficient weight for proper traction and pulling ability. Since power only comes from the mother unit, the sets have been proven to reduce fuel consumption by more than one-third compared with a pair of conventional locomotives, G&W officials said. Some locomotive devices are notching fuel savings for the company, too, especially in colder regions. Forty-six percent of G&W’s North American fleet is equipped with various devices, including more than 200 APUs, 100 plug-ins and 100 AESS sensors. Georgia Central Railway uses one of 18 mother-slug sets that G&W employs to help cut diesel consumption. For Watco Cos. LLC, a combination of technological and training advances also are helping to boost efficiency. The company — which owns 37 regionals and short lines — has used Wi-Tronix’s GPS-enabled device for the past seven years to monitor train speed and fuel usage. The device now is installed on half the company’s fleet, or about 225 locomotives, said Watco Vice President and Chief Mechanical Officer Keith Testerman. “It helps us be more aware of fuel usage and to better understand idling,” he said. Over the past year, Watco also has tested and implemented a Gamma 88 fuel additive distributed by EnviroSave LLC that’s designed to reduce carbon in diesel. Projected by the distributor to provide 6 percent in fuel savings, the additive now is used in half the fleet. Meanwhile, a new training center is available to help sharpen engineers’ fuel-saving skills. In May, Watco opened a Safety Through Awareness and Training (STAT) Center near Fairfield, Alabama, that features classrooms and two simulators. The STAT Center will provide engineers more consistent training on train handling and more knowledge on dynamic braking, which helps saves fuel because it responds quicker than air-braking systems, said Testerman. Engineer training previously was conducted on a train and mainly was based on the trainer’s own knowledge, he said. For Montana Rail Link (MRL), locomotive acquisitions and technology adoptions helped the regional cut fuel usage 2.5 percent in 2016 versus 2015 consumption even though traffic increased 5.6 percent year over year. The railroad — which operates about 900 miles of track in Montana and Idaho — has spent more than $55 million over the past several years to purchase 25 fuel-efficient locomotives, install APUs, obtain engine additives and change components on older motive power. Among the regional’s 82 locomotives, all 25 SD70Aces feature AESS devices, 26 others feature APUs or Hotstart engines, and two feature a fuel optimizer designed to regulate the throttle position depending on the input request and locomotive type in a consist, said MRL CMO Rourk Price in an email. The railroad also uses a fuel performance catalyst additive in older motive power to make diesel burn more efficiently and Interstate-McBee’s ECOTIP® injectors in all overhauled engines to help save fuel. Freight-road managers realize they need to continue tackling fuel management from many angles to keep gaining an efficiency boost. That’s why OmniTRAX created a standardized fuel conservation policy that identifies various processes and measures. “Our fuel policy ranges from a simple ‘get off, shut off’ program to eliminate engines idling more than 15 minutes, to train handling techniques on each subdivision on each railroad, to on-board management of fuel usage through technology,” said OmniTRAX’s Sabatini.